The sun is shining, the water is calm and you’re out on a boat. Sounds ideal, right? 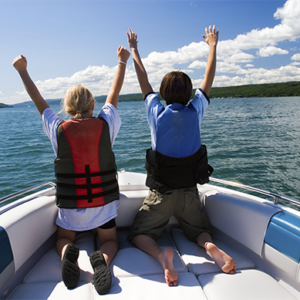 While hanging out on the boat on a beautiful summer day is a great way to make memories, there are a few things you should do before the warmer weather arrives to ensure those memories are good ones. First, give the boat a good cleaning when you bring it out of storage. Make sure there is no obvious damage that should be repaired. Take the boat to a qualified marine mechanic and have the engine, lights and other equipment checked out so you have peace of mind when you’re ready to put the boat in the water. Many of us love to get out on the water right after the ice has gone out for some early fishing. This time of year poses some additional challenges that you should always be aware of to keep everyone onboard safe. Be mindful when you’re out early in the season, the water has not had time to warm up and if the boat capsizes, and someone goes overboard, hypothermia can set in within minutes. Plan for the unexpected – make sure you have all essential gear and keep an eye on the weather as it can change quickly and you may need to modify your plans. Make sure everyone is wearing a Coast Guard approved life jacket that is appropriate for their size/weight. Check that your boat has all of the necessary safety equipment before you head out on the water, including fire extinguishers, flares and first aid kits. Never operate the boat under the influence of alcohol or drugs. When waterskiing or tubing, two or more people are required to be in the boat at all times. Let friends and family know where you will be and have a fully charged cell phone or marine radio available. Take a boater safety course, especially if you are new to boating. Always check the weather before leaving the dock and heed small craft advisories.